First, before you say anything, I know "healthy" and "refried" are a contradiction in terms. When I was growing up we rarely went out to dinner, but when we did it was to either Chi Chi's or Tumbleweeds, two Mexican restaurants in Louisville, KY that both served delicious refried beans (at least to my 10 year-old palette they were delicious). Refried beans are one of those particularly yummy Mexican inventions that are great on their own, in a burrito, served with rice and the list goes on. Yet they are anything but healthy. 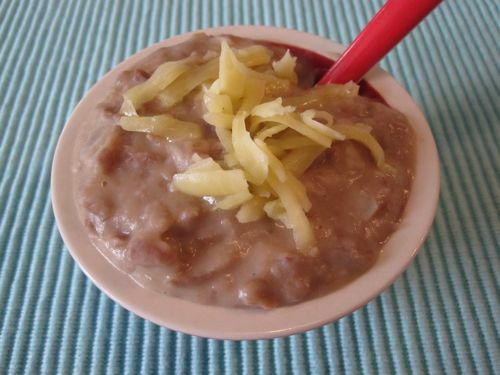 Most refried bean recipes consist of a smooth puree of pinto beans mixed with tons of lard to made them creamy. Just the thought of lard makes me want to gag, but I do love the taste of those creamy beans. I came up with this healthier version so Kenya and Chloe don't have to miss out entirely on my great food memory. This twist on refried beans retain the soft and creamy texture of the original and are also a perfect puree for babies. And toddlers, big kids, Mommy and Daddy, too! 1. Heat olive oil in a small heavy bottomed pot. 2. Saute the onions for 5 minutes or until translucent. Add the garlic and cook another minute. 3. Add the pinto beans and salt to the onions and mash with a potato masher or fork. 4. Add water, stir and cook until heat through. *Allow to cool, place in appropriate tupperware or ziploc bag and freeze up to 4 months. When ready, defrost in a pot up under low-medium heat until heated through or defrost in fridge for 24 hours. My husband is a huge fan of \"real\" refried beans, not the stuff in the can. But we never tried making it ourselves. One day we had some extra pinto beans and I thought of this recipe. They were great! We will definitely make them again and I love how much healthier they are than the canned version. Thank you! We love this and it is so easy and fast! I like to make it with half a small onion and half the salt. Maybe the beans I use already have some salt. Yum! How much beans should I use if use dried beans? Thanks! I have a large crock pot and cook about 1 pound at a time. I only put the beans in the pot and fill about 3/4 with water and add salt. I set the crock pot on high for 7 hours over night and they are perfect the next morning. made it tonight. it turned out great--- very healthy and full of flavor. thank you! I can't buy canned pinto beans here in the UK so I'm wondering how to MacGyver dried ones to work in this recipe. Do I just boil them until soft? I've never used them before. Thanks! They have directions on the bag, normally. For a pound of dried beans you need to cover anout an inch or two higher than the beans and soak over night ... Drain and rinse. Then bring the beans and about 6 cups water to a boil and cover (or rather tilt the top slightly for a vent) and turn the heat down to simmer for around 3 hours to make them all soft again. Just made some refried beans tonight, wish we had seen this recipe to try. But my boyfriend knows his recipe by look and taste, but if I have to cook them, trying this recipe out. I live in London and have found canned Pinto Beans at Ocado and various health food stores. Pretty section of content. I just stumbled upon your weblog and in accession capital to claim that I acquire in fact enjoyed account your blog posts. Any way I will be subscribing on your feeds and even I fulfillment you access persistently fast. Would this work with black eyed peas? Yes, I think they would work beautifully because they are a softer/mealy bean! I make \"refrained\" beans like this: sort and wash my beans, chop an onion, add 3 cloves chopped garlic, and two bay leaves. Cover with two inches of water and cook for 2-3 hours until tender. Remove bay leaves and season to taste with salt, pepper, and garlic powder. Blend using an immersion blender until smooth and they look like refried beans. Delicious and no fat added!